Explore stunning Istanbul with its bazaars and mosques, wander around the battlefields of Gallipoli, see Roman ruins in Pergamum and Ephesus, discover the beautiful Aegean Coast, the natural wonder of Pamukkale and the jewel in Turkey’s crown - Cappadocia, with its amazing underground cities and whimsical landscape. 2 and 30 Nov 2019, subject to availability. Saturday. Welcome to Turkey and the start of your holiday. Included arrival transfer to your hotel. Spend the afternoon at leisure or head out to explore the city. Istanbul is easy to get around on foot and there are plenty of restaurants and cafes dotted about the city. Enjoy a tour of the Old City from where the Byzantine and Ottoman Empires were ruled. We’ll visit the stunning Blue Mosque famed for it’s blue Iznik tiles, Hippodrome, Hagia Sofia – constructed as a Basilica in the 6th century by Emperor Justinian and Topkapi Palace. Istanbul – Gallipoli. Today we explore ANZAC Cove and the many memorials dotted across the WW1 battlefields. Our guided tour takes in sights such as ANZAC Cove, Lone Pine Memorial and cemetery, Chunuk Bair Memorial and cemetery, the Nek, Johnston’s Jolly and the many fortified trenches still clearly visible amongst the scrub after all these years. Gallipoli – Kusadasi. This morning we enjoy a short guided tour of Troy! The legend of the lost city of Troy and Homer’s poetry was bought alive by it’s rediscovery in 1863. Subsequent excavations revealed nine ancient cities, one on top of the other, dating back to 3000 BC! 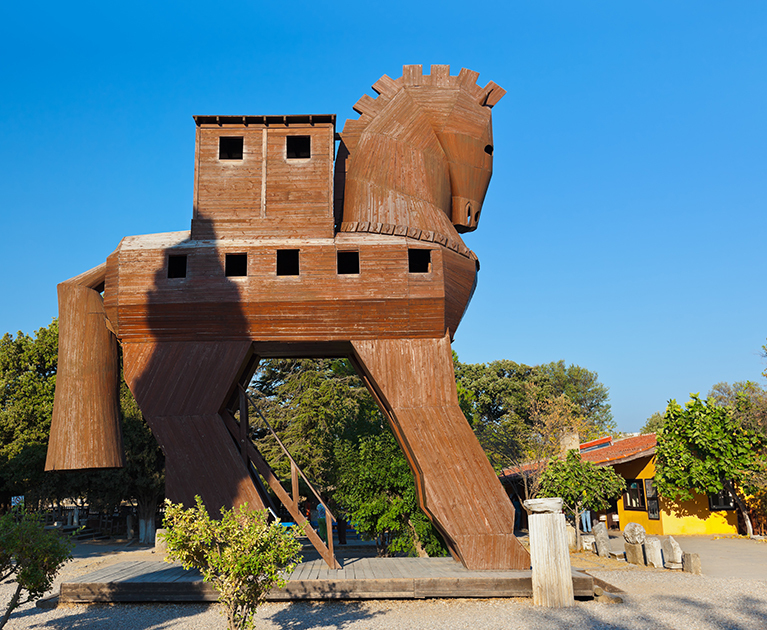 We enjoy a tour of the ruins and bear witness to a replica of the stoic Trojan wooden horse that, as the story goes, was filled to the gunnels with Aechaean soldiers who helped sack Troy. Driving further south to the ancient ruins of Pergamum, home to one of the steepest, vertigo – inducing amphitheatres in the classical world. Pergamum was also famous for its Asclepion (medical centre). We continue to Kusadasi on the Aegean Coast via a leather manufacturing house. Today, we explore legendary Ephesus – positively the best-preserved classical city in the eastern Mediterranean. Ephesus, under the Romans was a vast city with a population nearing 250,000, revelling in prosperity from commerce and visiting pilgrims who came to see its great Temple of Artemis – one of the Seven Ancient Wonders. We have plenty of time to tour the marble ruins of Ephesus. Be sure to see the famous Library of Celsus, the gymnasium of Vedius, Stadium, and the Great Theatre. We’ll see ancient public toilets, a brothel, fountains and various temples. We also visit a carpet manufacturing house. Kusadasi – Pamukkale. Driving east, we arrive at Pamukkale – home of the famous gleaming white calcium terraced pools. Known locally as the Cotton Castles, they are a natural phenomena and gift of Mother Nature. Pamukkale was formed when warm, calcium rich mineral water cascaded over the cliff edge, cooling and depositing in the process. The calcium built natural shelves and pools on the cliffs, known as travertines. Take a barefoot walk along the traverines or opt for a dip in the warm waters of the Pamukkale Thermal pool, with its submerged fragments of fluted marble columns. Our last stop for the day is the ruined spa town of Hierapolis, famed for the curative powers of mineral springs, dammed to create communal baths. Pamukkale – Cappadocia. On our drive to Cappadocia, we visit some ancient caravanserais such as Sultanhani caravanserai. Tonight (day 7) why not join us on an optional and fun Turkish folklore evening out. On day 8, after breakfast and a good night’s rest, we enjoy a guided tour of Cappadocia – perhaps the jewel in Turkey’s crown. Cappadocia is one of Turkey’s most extraordinary national treasures. The utter improbability of the seemingly surreal landscape has to be seen to be believed with its ‘stuff of fables’ cave dwellings and phallic ‘fairy chimneys’ landscape. Whole troglodyte villages, subterranean churches and fortresses have been hewn from the soft, porous, eerily eroded rock of Cappadocia. A guided tour of the region takes us to the World – Heritage listed site of the Göreme Valley where you’ll see stunning examples of rock-cut Byzantine churches, chapels and temples and Zelve with its phallic-like eroded landscape. Stopping on the outskirts of Goreme Village we have the opportunity to see Pigeon Valley where century’s old pigeon houses are carved into the surrounding cliffs, the pigeon droppings that litter the area have been used as fertilizer on crops for generations. Here you will also have the opportunity to visit an Onyx shop, specialising in historic jewellery designs unique to Turkey and using local materials and craftsmen. For those not interested in shopping spend a little time relaxing and grab a drink from the local cafe. This evening, we enjoy dinner at the hotel. 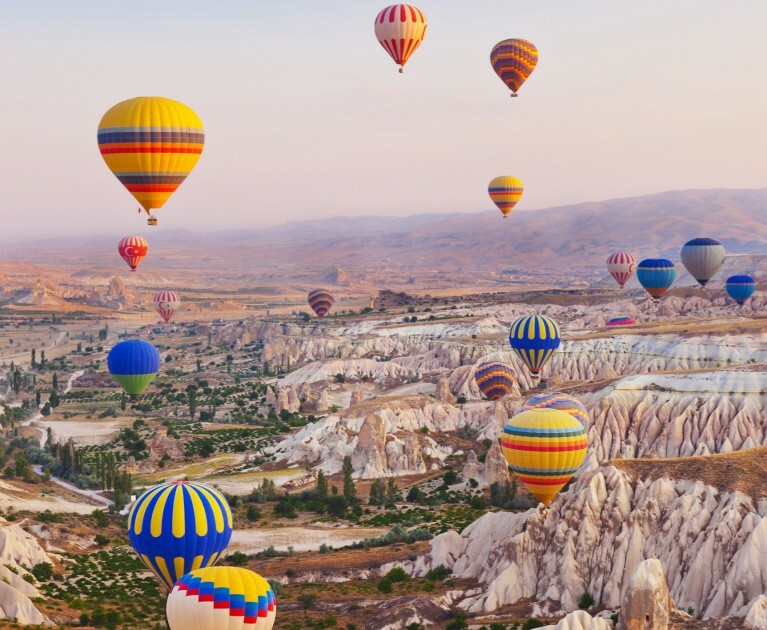 Cappadocia – Istanbul. Today we head back to Istanbul, stopping en route for lunch (payable locally). We arrive in Istanbul in the evening. If you’d prefer to avoid the long journey overland today we also offer the opportunity to fly from Cappadocia to Istanbul. Monday. After breakfast your tour draws to a close. Onward departure transfers to Ataturk International Airport are offered complimentary at 11am and 1:30pm today. Happy travels! Advertised prices are per person, twin share, correct at time of publication and are subject to availability, withdrawal and change at any time without notification due to fluctuations in charges and currency. Offer valid on new bookings only. ^Bonus offers are included in the advertised price. Non-refundable and non-transferable deposit of $400 per person required within 7 days of booking to secure the reservation. Not combinable with any other offer except past passenger loyalty discounts. Full payment required 60 days prior to travel. Standard cancellation fees apply. Valid for singles, supplement applies. Other conditions apply. Please contact me for full terms and conditions.